At our Lexington, KY oral surgery practice, we provide oral surgery services including dental implants, tooth extractions and cosmetic dentistry procedures. If you choose to undergo an oral surgery procedure at our office, we will take every step to ensure you are prepared for your surgery and recovery. Here are some tips we would like to offer to ensure your best experience possible. The evening prior to your dental surgery typically involves checking in with your driver who will be transporting you after your procedure. Because most oral surgery procedures require some form of anesthesia, we do not recommend you drive yourself home. In addition to making these arrangements, we will typically ask that you refrain from eating or drinking anything after midnight. An exception to this is if you are diabetic and need to eat to maintain your blood sugar levels. We will also typically review your medications with you to determine if there are any medications you should not take the night before or morning of your surgery. You may also want to take this at-home opportunity to prepare your recovery space. This could include making handy warm blankets, books, magazines, a phone charger, television remotes and any other items that would be easier to have on-hand. Ensure your cabinets and refrigerator are stocked with some post-surgery friendly foods, such as mashed potatoes, gelatin, pudding, soups and any other soft foods. You will be given instructions on how to care for your teeth and mouth after surgery. This includes applying cloth-covered ice packs for 10 to 15 minutes at a time. You will typically change out gauze and/or start rinsing out your mouth about 24 hours after your surgery. Allowing yourself enough time to rest following your procedure is crucial to your recovery. You can expect any swelling to go down after about 24 hours following your procedure. However, some surgeries, such as wisdom teeth extractions, can require one to two weeks before your mouth fully seems to heal. Call Erena & Peterson, PLLC Today! For procedure-specific ways you can prepare for oral surgery, call our Lexington, KY oral surgeon's office at (859) 268-4423. Are you a patient of Prairie Run Dental, SC? If so, we would love to hear about your experiences below! If you’ve ever enjoyed an ice hockey game, whether live or in the comfort of your own living room, you’ve probably noticed that a lot of the players are missing teeth. Such are the hazards of sports! However, if you also enjoy participating in certain sporting endeavors, then you are all too aware that losing teeth is a common occurrence. Maybe you have even experienced this problem first hand and you’re tiring of going around with a gaping smile. We know how discouraging it can be to not have your smile exactly as you want it; however, now you can replace those missing teeth and restore your smile with dental implants at our Lexington oral surgery office. “What are dental implants?” you might be wondering. Let your dentist tell you about this wonderful way to solve tooth loss. Once your cosmetic dentist has already deemed you a healthy candidate for implant dentistry, the first real step in the treatment process is to place a small metal post into your jawbone. This implant serves the same purpose as a tooth’s root. The metal post will be given a couple months to heal to allow the bone and surrounding tissue to fuse with it, giving you a solid, permanent foundation. Once your mouth has been given ample healing time, one of our Lexington oral surgeons will then place an artificial tooth on the implant. This tooth is made with only the latest technology, so it has the same look and color as the rest of your natural teeth. No one will ever be able to tell the difference. This is a long-term option for tooth loss. 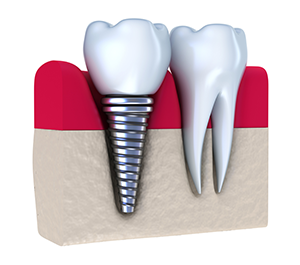 Since an implant is actually embedded into the jawbone, there is no concern that it will come loose or fall out. 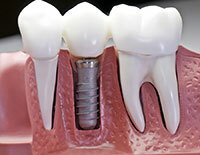 Nothing could be sturdier than a dental implant. If you treat your dental implants well, you could be looking at a beautiful, perfect smile for many years to come. 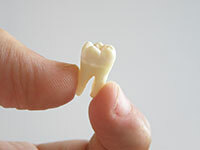 Since this is an artificial tooth, you don’t have to worry about cavities. You also don’t have to treat it any differently than the rest of your smile. Of course, you should always practice good oral hygiene. Increase your self-confidence. A smile says a lot about you, and if your smile doesn’t look its best, it can take a toll on your self-esteem. Why not give yourself a confidence boost by treating yourself to a refreshed and revitalized smile? Enjoy your favorite foods again! This might not be the first thing that comes to mind, but if you’ve ever suffered through a meal because of tooth loss, then you know how frustrating it can be. But with dental implants, now you don’t have to fear every meal. In fact, now you can sit back and relish every last morsel. Are you ready to end your tooth loss problems once and for all? Our oral and maxillofacial services in Lexington are ready to help give you the smile you’ve never thought possible. Contact us today to set up an appointment. Have dental implants changed your life? If so, we would love to know in what ways they have made your life just a little bit easier. No change is too small. We want to hear it all! In the words of Oscar Wilde, “With age comes wisdom.” And in the words of your dentist, “With age comes wisdom teeth.” Our Lexington dental staff offers some wise advice about dealing with erupted wisdom teeth. Check it out below! Where Are Wisdom Teeth Located? The wisdom teeth are your third molars, so they sit in the far back of your mouth. Have the teeth in the back of your mouth felt sore? It may because you have an impacted wisdom tooth or one developing. Nine out of ten people have an impacted wisdom tooth, according to the American Association of Oral and Maxillofacial Surgeons. An “impacted wisdom tooth” means the tooth hasn’t fully erupted past the gumline. It’s important to see a dental professional to discuss the need for an extraction or other plan. Why Would an Impacted Wisdom Teeth Need to be Removed? You may not feel any pain or notice problems, but that doesn’t mean a wisdom tooth can’t do some damage. As time goes on, that tooth will continue to put pressure on the neighboring molars. This can cause one or more serious dental problems: infection, trauma or cyst. In the best-case scenario, the wisdom teeth will fully erupt and maintain function. This is possible if the third molars are cavity-free and surrounded by healthy gum tissue. To combat tooth decay and infection, you need to pay extra attention when cleaning your back teeth. You use your molars to break down food, so plaque bacteria and food particles are always a concern. Even if wisdom teeth erupt normally, there are still risks to watch out for. It’s time to wise up to the issue. To schedule a wisdom teeth appointment in Lexington, call (859) 268-4423.